My sister called and told me that while she was cleaning she had found a few family documents. They came from my fathers stash of things that were found when we were cleaning out the house. First, and most impressive, is the marriage license of my grandmother, Anna Bartels Schridde Krah. Anna and William did not have any children. She remarried almost one year after my grandfather, Willi Schridde, untimely death. What is interesting, is the elaborate and colorful design. They were married at a Justice of the Peace on August 10, 1937. The second is a Baptismal Certificate dated March 31, 1940 from the HOMEVILLE CHRISTIAN CHURCH She had been Baptized in 1900 in a Lutheran Church in Celle, Germany. She had saved the original Baptismal Certificate, so why the second Baptism? Third is the official document of the marriage. This must have been a standard type given to the couples. Where did they meet? I seem to recall that William knew my grandfather Willi from work. Did she get married because she had not yet become a citizen. Was she unable to find work? Did they truly love each other? Their marriage lasted lasted thirty two years, until my grandmothers death from leukemia. My mother, Gerda Schridde, was fifteen time at the time of the marriage. My mother spoke kindly of him and took care of him after he became too ill to take care of himself. His last few months he was in a Nursing Home because he required more care than my mother was able to give. I will give my new hand held scanner its maiden voyage on the new documents. It should be arriving soon. I found the Civil War file on Darius Anthony and sent it to my cousin Helen, who had given me the information on Darius Anthony, which I had posted a few days ago. The information was that he had died in Camp Sumter GA. Helen said that last year she had gone to Danville Va and found that was were he had died in a battle there. His wife Jemima Rhodes Anthony had received from soldiers who were with him was incorrect and that is where his wife was informed he had died. Now, where is Darius buried??? I will have to speak to Helen again and see if she had found his grave. While we were out at dinner the other night Chuck said "I couldn't sleep last night so at 2 AM I was watching Home Shopping and bought you something." Claudia, thinking, what could he have bought at 2 AM that could have been of interest to me. "It regularly cost about $150 but I paid $89." "What is it I asked?? Now I am intrigued. "It is about 15 inches long and 1 inch think, and you wave it over documents"
"YOU BOUGHT ME A HAND SCANNER???????" "Yes, you know about them?" ""Yes" I said "Some one had posted on their blog that they got one and how much they liked it." "It will be here in six days." Who would have thought that at 2 AM they would have been selling hand scanners on one of the shopping channels. It was so sweet of him, and he said I could use it one my field trips to copy documents. Now that he is retiring he can come with me. I really hope it works as good as they said in the advertisement. ALL THE TIME I THOUGHT…..
My great grandmother, Bridget Naughton, was from County Mayo. I did a search on the new LDS pilot search and I came up her listing as being from Killeroren, County Galway. Her date of birth and parents were correct, so I found out she was from Galway. I had written to a man who has a major web site concerning the Naughton name. He and I had corresponded before and he is extremely knowledgeable. He did a little search for me and he found information that the Naughton and Ward families lived near each other in Killeroren. He also found and sent me the number of the microfilm reel that the town was listed. More info to send for and peruse. He also told me that the LDS Church holds the most popular films or fiche at the Church. I have to investigate. I was entering data and found his great great grandfather, Darius Anthony, died 28 May 1864 at Camp Sumter GA. I knew I had heard of that place before and the time was during the Civil War. So I Goggled the Camp and found it was the infamous Andersonville. I told Chuck who appeared surprised and shocked to find his ancestor had died there. I found the military file on Footnote and I need to pursue this man. I have made quite a few discoveries this past week. Each answer begets more questions. The first posting of a blog was January 4, 2004. I started it on the now defunct AOL Blogger. The idea was novel and it seemed like a good outlet for my frustrations. My father was ailing and still making my sibs and I crazy. I am glad there were five of us in the area and we only had to deal with idiosyncrasies in small doses. It is difficult to watch the decline in strength as your parents age. My mother and father were both mentally alert but physically ill.
My mother died from cancer of the bile duct in 1995. It is extremely rare, but as they say, someone is going to get it. She lived four years after her diagnosis and I am thankful that most of the time he quality of life was good and she did not have much pain until the last few weeks. Even then she had to take only Tylenol with Codeine. At that time I had no interest (?????) in Family History. Perhaps with their illness I had other things on my mind. 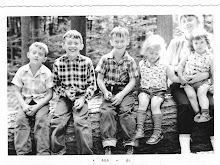 It wasn't till after my fathers death in March of 2004, when we were cleaning out his house for sale, did I come upon a lot of saved documents and at that point in time I became intrigued with the people who had come before me. It was the same with my husband's family his parents died within a few months of each other in 1996.Coleman had been sick for years and her death came as no surprise, but his father's passing was a surprise. As we looked back on it, during the time of his wife's funeral he was complaining of indigestion. We realized later that it was probable that at the time he was having an MI, although he did not have the typical "crushing" chest pain. I think his fathers death was harder on him because it was unexpected. I started this journal on December 22, 2008. I thing perhaps by them I had resolved the matters of my parents deaths and wanted to remember them and try to solve the mystery of their ancestors. My first original post followed by my first Genealogy Posting. After going thru the papers today I always find things that I have overlooked or perhaps I did not realize the significance. My great grandfather was born in 1852, so the date of 1845 would be in the right time frame, but how often was the name missing the O?? Do other do the same thing? Do we all find things that have been hiding in plane sight? I found a Footnote paper I had copied. My other great grandfather, Thomas Dowd and his brother in law, Thomas Mulroy (married toThomas sister Norah) Cummins Finnerty had signed as the sponsor for Patrick O’Toole and his wife Bridget. Was Patrick OToole's wife, Bridget, Thomas Dowd sister??? When Thomas was a sponsor for Thomas Mulroy, his sister Catherine Dowd Mulroy was the wife. I have the number of the microfilm for the parish where Thomas lived in County Mayo, I hope this helps to solve the mystery…..
Fiddle dee dee,tomorrow is another day…. Today I got the impetus to get a few things done. I decided to organize and create new folders for my genealogy. I got as far as moving the random information into my huge Genealogy File. I, somehow, had things scattered in all sort of files, in my document, desktop and download sections. Well, I got as far as one large file and backed them up on two flash drives. Guess I have to go back and reorganize according to families and their descendants. I have also many things to scan, but I will save that for a later day. Tom and Gerda camping, looks like Gerda has on her “German” Face. A world of thanks to T.K who suggested a quick and easy want to copy and past from an Adobe file. Here's another idea. If you open the PDF file, go to the page you want to make a jpg of. Right click on it and you should get a little menu that offers you some options including "Select Tool". Click on that, then start at the upper corner of the image you want, click and drag to the diagonally opposite corner (if the whole image is not in the window that's okay, just keep dragging a little below the bottom of the window and it will scroll the page as you drag. When you release the mouse, the area you want will be selected. Right-click on it again and this time you are offered the ability to Copy Image. You can then Paste it as a new image in Paint Shop Pro or whatever image editor you have, and then save that as a jpg. And it works perfectly…… I did a Google search and found many programs for converting PDF to Windows and I even downloaded one. But when I clicked on the the icon for the program a template came up with no instructions on “how to do.” I am pretty good with the workings of the computer and I was going to work on it this evening. I copied and pasted it in Windows Live Writer and it magically appeared. Now if it disappears I will have to use a my photo editing software. I hope it stays. Now, the above document states that Patrick obtained his citizenship in 1884. That was twelve years after he arrived in the USA. This document was a copy of the original issued a few years later. My question now is why he had it reissued? And my second question is why I can not find the same information on Footnote, or any other data base?? My grandmother Anna Bartels Schridde and my great grandmother Maria Korbach Bartels. My great grandmother Anna Margarethe Hackmann and Heinrich Schridde and Family. My grandmother Anna Bartels Schridde, Willi Schridde and my mother Gerda Schridde Dowd. My mother Gerda Schridde Dowd and Claudia Dowd. My sisters and I, all married with children. Well, it was going to be. I went to the copy store to scan a few of my oversized documents. The first was my great grandfather Patrick O'Rourke's naturalization certificate from 1894. The second two were two German documents, one being my grandmothers Baptismal certificate and my grandparents marriage and other information from Germany. I asked the woman if she could scan and print in color. Yes, that worked well. She also said she could put those scans on my flash drive. Wonderful, I could post things on my blog. After I got home and went to transfer them from the flash drive to my computer, I discovered she had put them in an Adobe file. Now, how do I get them to transfer to my blog. I have been trying and can not get that done. I understand why she would put them in an Adobe file so they can’t be altered, but she should have asked me first. I have to get back to the drawing board on that one. The colored copies are too large to be put on my scanner. Any ideas will be appreciated. I think Richard was the type of boy who always got into mischief. HOW THOMAS TRIED TO KILL RICHARD. It had been the first sunny day after a few days of rain. The plan was to build a raft and take it for a voyage. I suppose they were about ten or twelve years old at the time. The boys spent all day gather wood and constructing the raft. Soon came the launch in the summer afternoon. Some how, his brother Richard got on first and the raft got away. There was his younger brother adrift on the swollen and turbulent creek headed toward the river. Richard was screaming “Save me” The whole gang ran alone the banks and came to a small wooden bridge. As they lay on the wooden planks they could see Richard coming down Turtle Creek, still screaming. Richard was rescued and pulled upon the bridge. My dad said that his only thought was his brother was going to drown and it would have been his fault. And his mother, Gertrude, would kill him.